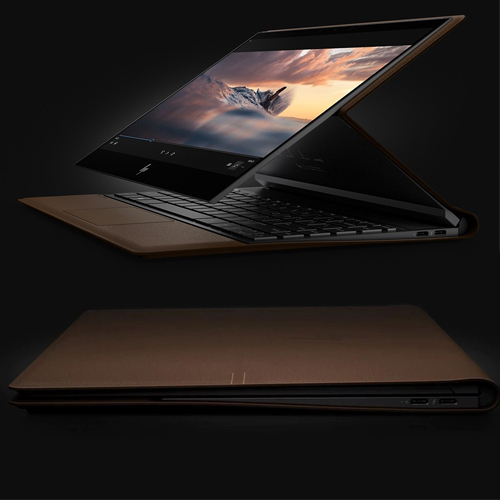 The HP Spectre Folio is covered in genuine leather instead of plastic or metal which gives it a very unique and premium appearance. The device can be used in three different positions - folded forward (covering the keyboard) to serve as a tablet, folded halfway such that the keys are covered but the trackpad is visible (tent mode), and finally as a laptop. The Spectre Folio has a 13.3 touchscreen display but the screen differs across models. There is a version with a 1-watt FHD display, another with a regular FHD screen, and a third with a 4K panel. The display is covered in Gorilla Glass and supports input via a stylus with tilt detection and 4096 levels of pressure sensitivity.